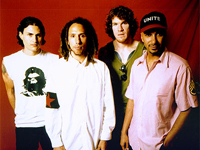 Rage Against the Machine earned acclaim from disenfranchised fans (and not insignificant derision from critics) for their bombastic, fiercely polemical music, which brewed sloganeering leftist rants against corporate America, cultural imperialism, and government oppression into a Molotov cocktail of punk, hip-hop, and thrash. Rage formed in Los Angeles in the early ’90s out of the wreckage of a number of local groups: vocalist Zack de la Rocha (the son of Chicano political artist Beto) emerged from the bands Headstance, Farside, and Inside Out; guitarist Tom Morello (the nephew of Jomo Kenyatta, the first Kenyan president) originated in Lock Up; and drummer Brad Wilk played with future Pearl Jam frontman Eddie Vedder. Rounded out by bassist Tim Bob (aka Tim C., born Tim Commerford), a childhood friend of de la Rocha’s, Rage debuted in 1992 with a self-released, self-titled 12-song cassette featuring the song “Bullet in the Head,” which became a hit when reissued as a single later in the year. The tape won the band a deal with Epic, and their leap to the majors did not go unnoticed by detractors, who questioned the revolutionary integrity of Rage Against the Machine’s decision to align itself with the label’s parent company, media behemoth Sony. Undeterred, the quartet emerged in late 1992 with their eponymous official debut, which scored the hits “Killing in the Name” and “Bombtrack.” After touring with Lollapalooza and declaring their support of groups like FAIR (Fairness and Accuracy in Reporting), Rock for Choice, and Refuse & Resist, Rage spent a reportedly tumultuous four years working on their follow-up; despite rumors of a breakup, they returned in 1996 with Evil Empire, which entered the U.S. album charts at number one and scored a hit single with “Bulls on Parade.” During 1997, the group joined forces with hip-hop supergroup the Wu-Tang Clan for a summer tour and remained active in support of various leftist political causes, including a controversial 1999 benefit concert for death-row inmate Mumia Abu-Jamal. The Battle of Los Angeles followed later in 1999, also debuting at number one and going double platinum by the following summer. In early 2000, de la Rocha announced plans for a solo project, and the band performed an incendiary show outside the Democratic National Convention in August. The following month, bassist Commerford was arrested for disorderly conduct at MTV’s Video Music Awards following his bizarre disruption of a Limp Bizkit acceptance speech, in which he climbed to the top of a 15-foot set piece and rocked back and forth.